Coming to Kötschach, where Hwy. 111 and Hwy 110 intersect, go east along Hwy. 111 9.1 kilometer. 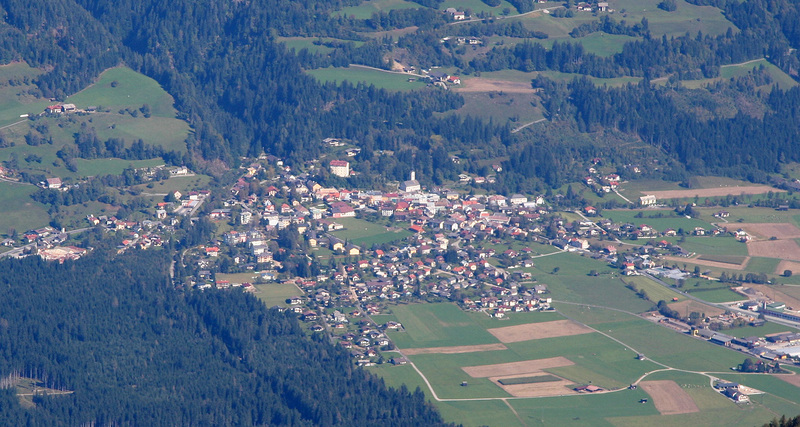 You have then passed through Dellach, and entered the small village of Grafendorf. Pay attention to the church in Graftendorf, just as you pass the small road (going left) that serves the church, your left turn will be the next possible road. The turn (left) is just before Hwy. 111 crosses a small bridge. Look for a sign on this road saying Reisskofelbad. If you arrive from the east on Hwy. 111, then note when you pass through the village of Gundersheim, again pay attention to the next church and turn right on the road immediately after crossing a small bridge. 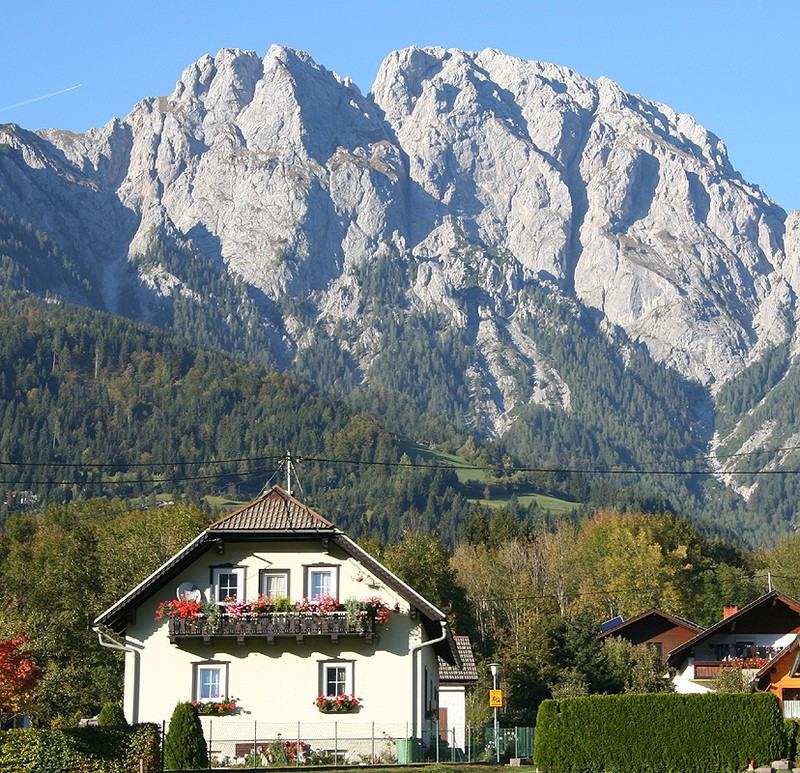 There is a sign saying Reisskofelbad. Measure from this turnoff. The road is pretty straight in the beginning. At kilometer 0.4, continue straight ahead. At kilometer 0.7, stay right. At kilometer 2.2, turn right. There is another sign saying Reisskofelbad here. At kilometer 3.2, make a sharp left at a T-junction. At kilometer 3.3, the paved road ends, but a quite nice dirt road continues. At kilometer 4.1, go right across a riverbed (hopefully almost dry! ), and continue to kilometer 5.3 where you keep right. At kilometer 8.2, there is a cattleguard and a small (flexible) barrier, drive slowly past it and it will swing aside. At kilometer 8.7, you arrive at a saddle and roadfork. There is parking right there. This is the trailhead, park your car. This location is N46:40.321, E013:09.492, elevation 1511 meter. Note: This road was not marked on my (brand new!) map (WK-223). Rather, a road starting in the village of Reisach seemed to be the road one needed. I explored this the day before, but was eventually informed that this road was blocked by timber and could not be used. The lady then told me about the "Reisskofelbad road" and the fact that it would deliver you exactly to the proper starting point. Route description: From the trailhead, head slightly downhill along the road that comes up from the left, relative to where you came driving. There are signs for route 235, Reisskofel. 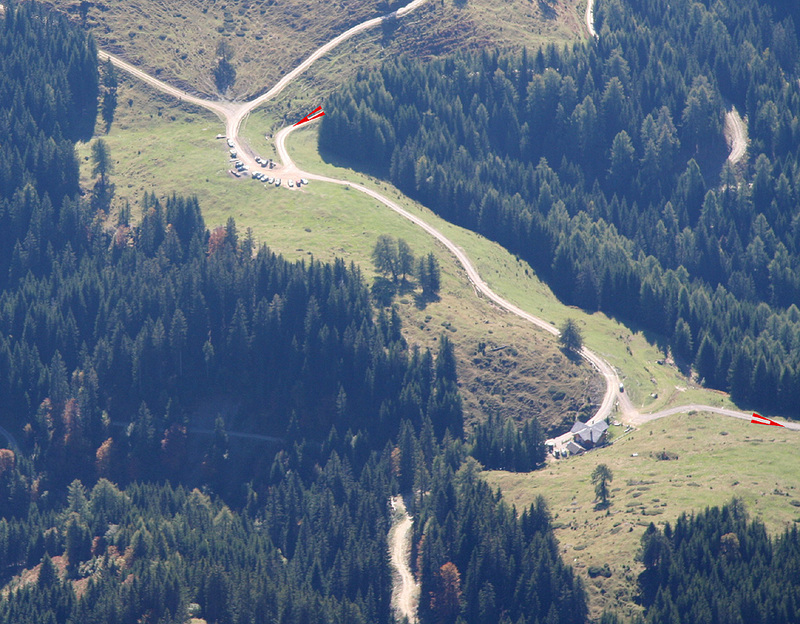 Shortly, you arrive at the small hut called Gregorihütte, continue along the road, now gently uphill. Relatively soon, just as the road makes its first clear curve to the right, the trail goes off left into the forest. There is also a yellow sign here saying route 235, Reisskofel. The trail immediately heads steeply uphill among the big trees. It follows a ridge that naturally climbs high on the mountain from the general trailhead area. After about 30 minutes, the forest opens up somewhat and you can see the slopes uphill and to your right. The trail shall gain the main east ridge of Reisskofel just west of Kleine Reisskofel, however, in order to achieve this, it must first go as high as possible. There is a marked variation of the route that climbs more directly to the main summit ridge, however, this is likely a bit steeper. 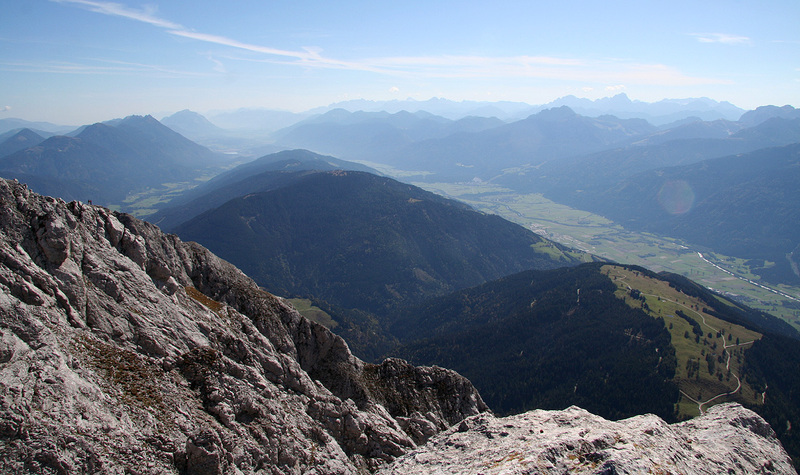 The normal route traverses to Kleine Reisskofel, and this is described here. Eventually, the trail tops out, there is a very ugly ravine on your left. Traversing right, the trail crosses the upper end of several gullies that would be harder to cross further down. The trail runs a bit up and down, but mainly horizontally to the right. It seems like there is only one possible "easy" path and that is exactly where the trail goes. There are a couple of scrambling sections (YDS class 2+), some of which are equipped with bolted cables. Under good conditions, these are really not needed. 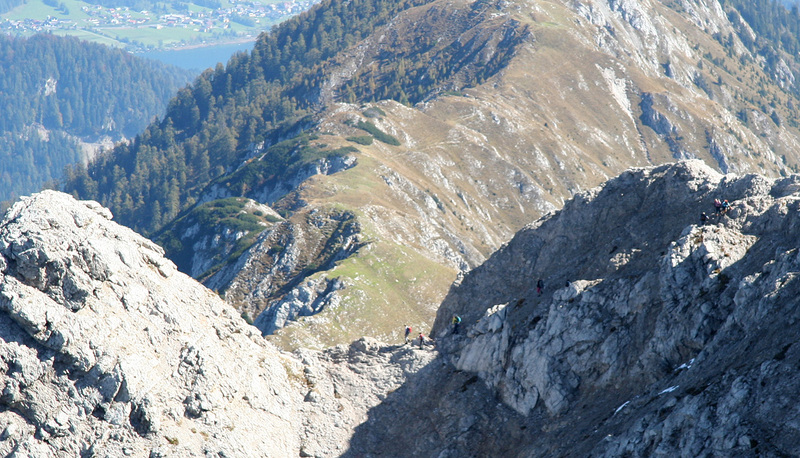 Finally, you will see the last traverse up to the col, just below Kleiner Reisskofel. This small top has its own summit cross. Arriving at this col, you notice that it is only one meter wide. There are trail signs with several routes here. Continue left, first along the ridge, then into the left side. 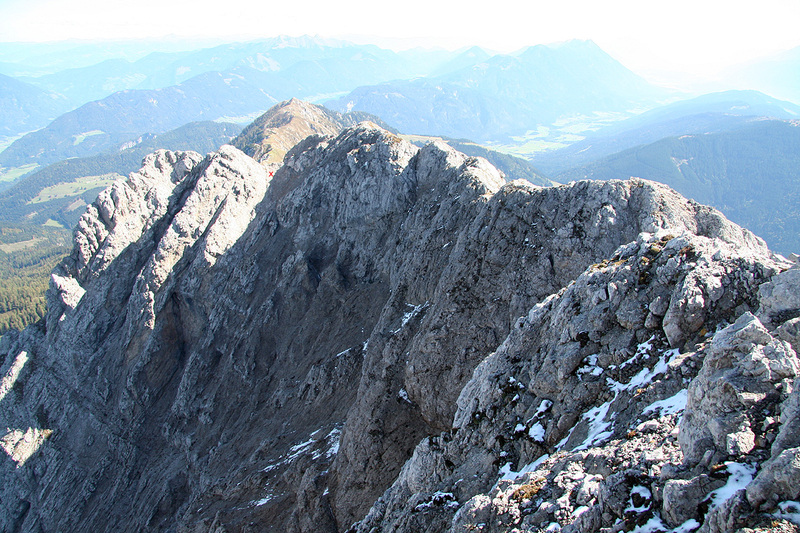 The trail now climbs partly in a couple of gullies to a new and higher col on the main east ridge of Reisskofel. 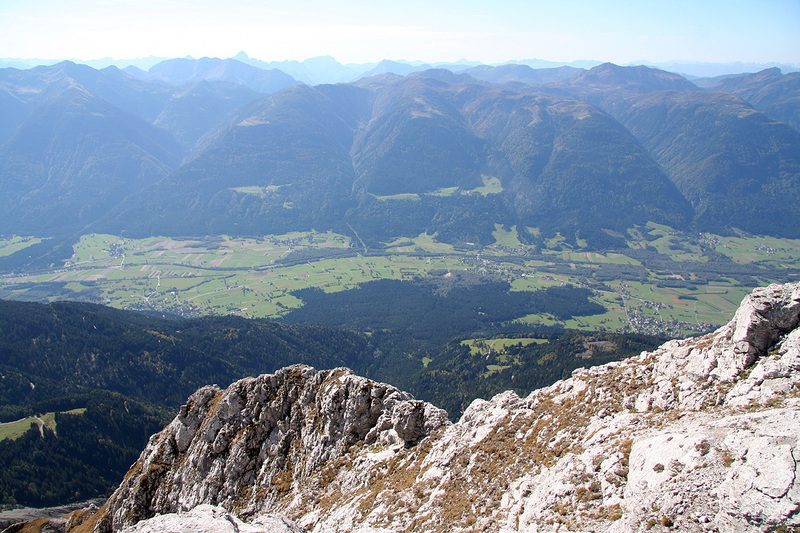 Be careful in order to avoid releasing rocks that might roll to climbers below you. This scramble is quite easy, low (YDS) class 3 terrain. From this col, you first traverse left along a pretty sharp ridge. 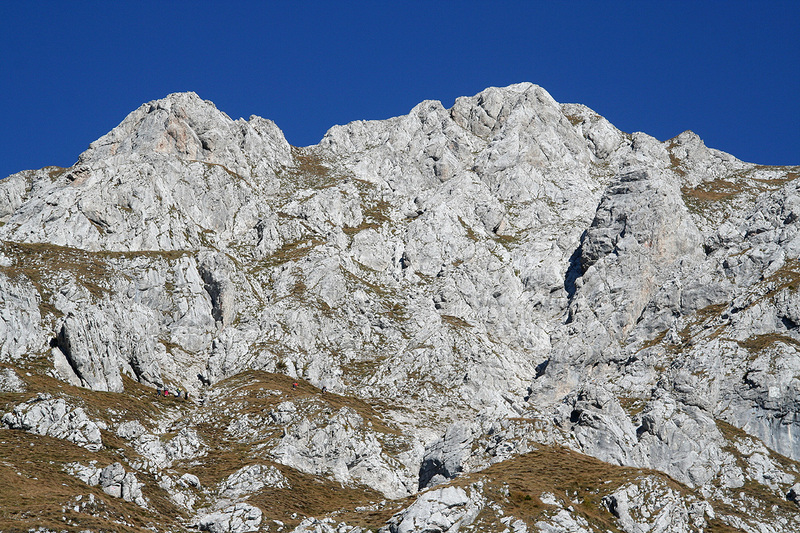 It is best to walk below this ridge and hold onto rocks near the top. 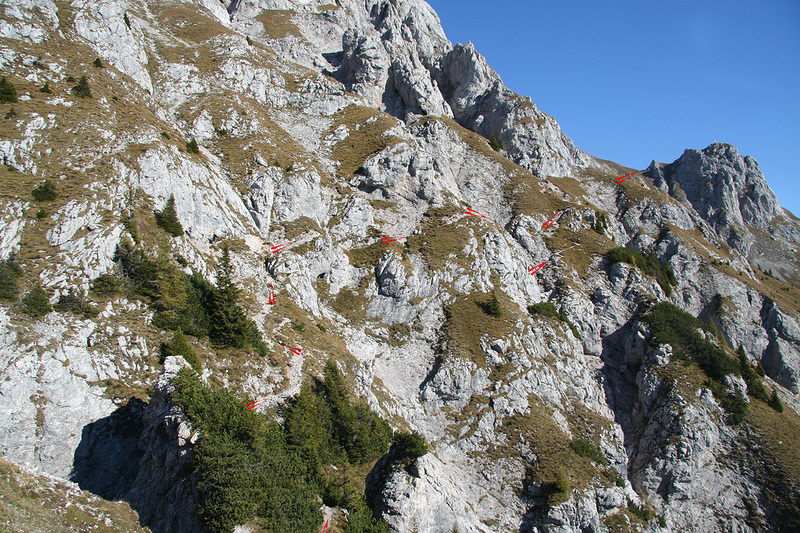 The route is well marked and continues on an ascending traverse until it regains the top of the main east ridge. (The small col can be seen where the sun and shaddow meet. From this point, the route runs more or less along the very top of the east ridge. This section is delightful! Excellent views, the exposure is significant to your right side, but also the left slope is sometimes quite steep. The ridge is pretty flat on the top, often only about one meter wide. The route will take you across a few small tops as well as descend a bit into one lower col. You can see the main summit along most of this way. Finally, you arrive at the last pitch. The trail here contours around on the right side before ascending the last few meter. 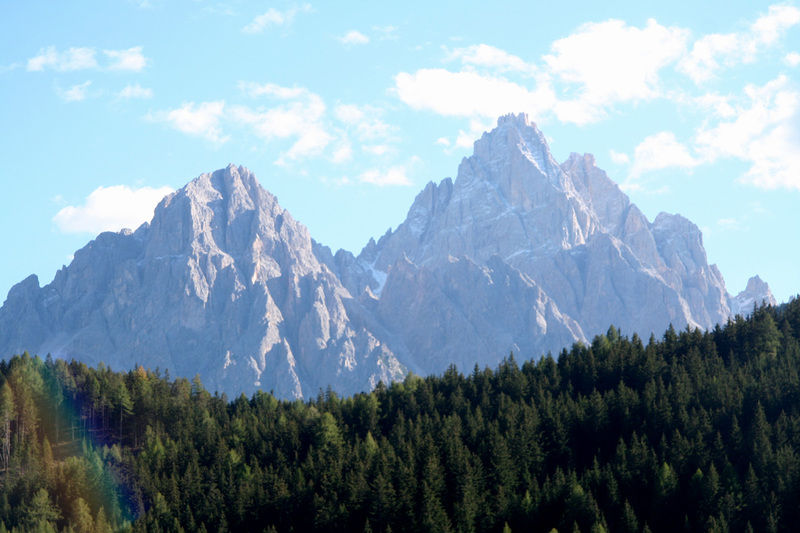 Comments: The day before I had climbed Cornetto near Trento, then I drove to Gailtal, stopping several times near the border crossing in order to enjoy the famous Sexten's Dolomites. The views of these mountains came as an extra bonus after a very nice morning hike. 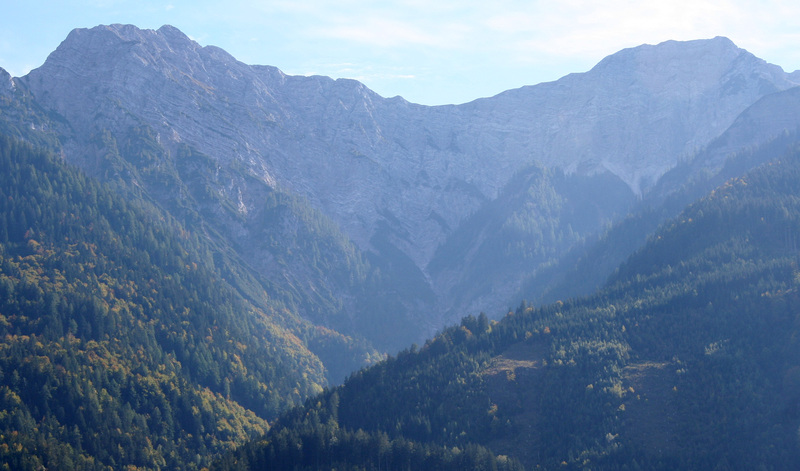 As I continued driving east in Gailtal along a very winding road, a very shapely peak caught my attention. I knew immediately that this would be my goal for Sunday morning. I had a very nice dinner the night before and took an easy morning. Started breakfast around 0815. The drive was short and uneventful and by 0900, I had arrived at the trailhead in brilliant sunshine. I started out at 0910 and quickly found myself "puffing" on the rather steep trail among the big trees. I met a few hikers that were already descending, truly impressive how early some people start. After about 30 minutes, I started to emerge from the forest and could see the mountain more clearly. 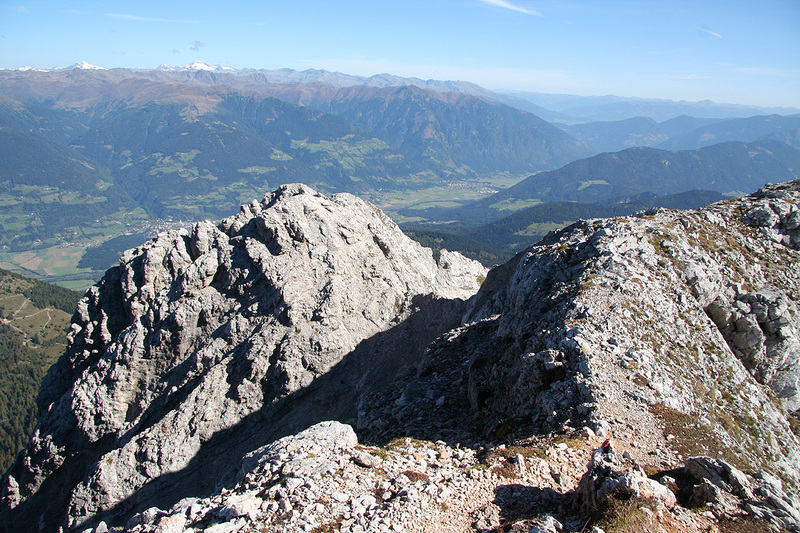 I knew that the route should traverse right, however, it was not easy to see a connecting route to the saddle next to Kleine Reisskofel. The route turned out to be quite impressive, by climbing quite high, one finds essentially the only easy path traversing right. I caught up with a couple of hikers and decided to rest when reaching the main ridge. 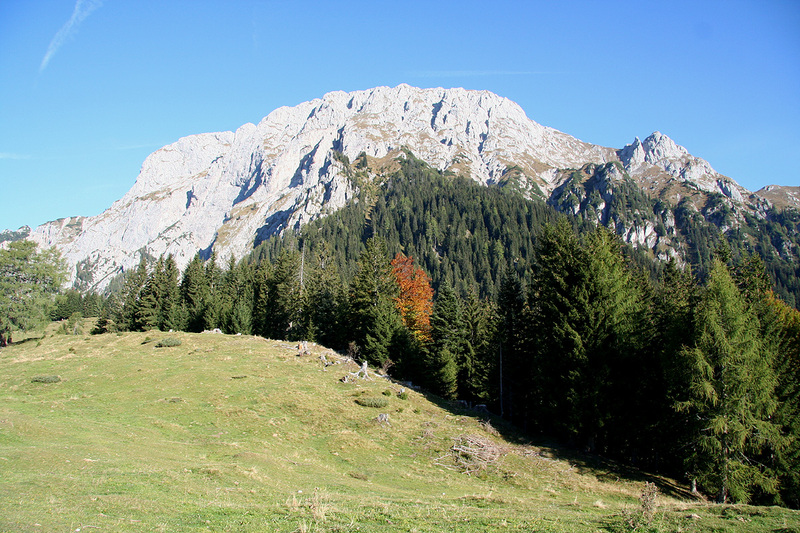 I was there around 1030, having gained about 600 vertical meter from the trailhead. Yet another very nice day, I could now see the next section of the route and a surprisingly large number of climbers. I left this col around 1045 and quickly gained the next (much smaller) col higher up on the main ridge. The next traverse had a slight trace of ice and snow, most likely since the shaddow keeps the sun away most of the day. Within a few more minutes, I reached the main ridge again, not a col, but the main ridge stretching its way towards the summit that now came into view for the first time. A very nice walk with some easy scrambling, but with quite some exposure. The north side dropped away more or less next to your boots, while the south side was steep, but still seemed a bit more friendly. 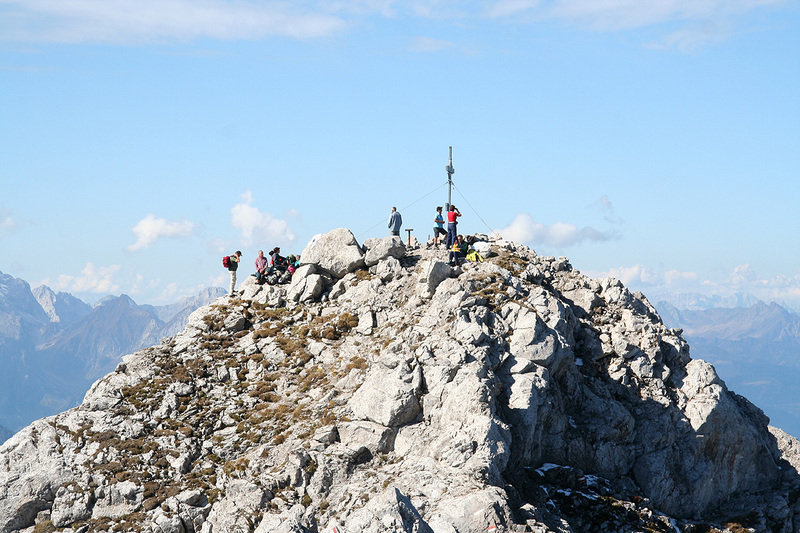 I could see more people on the summit and about 45 minutes after leaving the col below Kleine Reisskofel, I arrived at the summit. I talked briefly to some of the other climbers, signed the summit register and took photos. Very impressive views, the two valleys on the south, Gailtal, and on the north, Drautal, side are about 600 meter, so the vertical drop (left and right!) 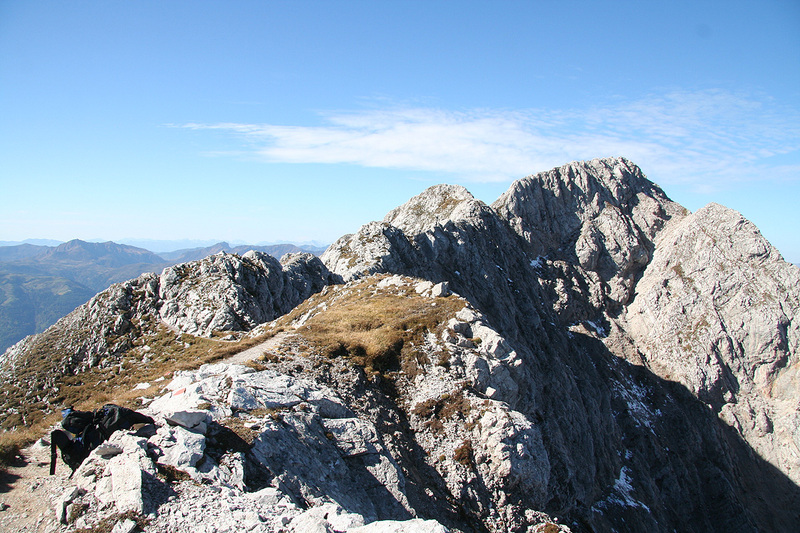 of the summit ridge is close to 2000 meter. Looking more across, one can see several nice mountains, the Dolomites a bit in the haze further south, while peaks with glaciers are visible to the north. I started the descent at 1200 and arrived back at my car at 1345, very happy about my descision to climb Reisskofel. 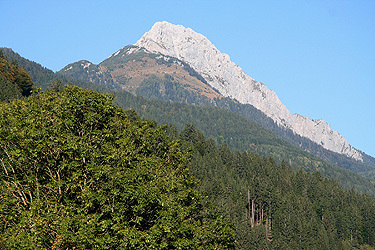 Reisskofel, as seen from Gundersheim, the vertical rise is 1900 meter. 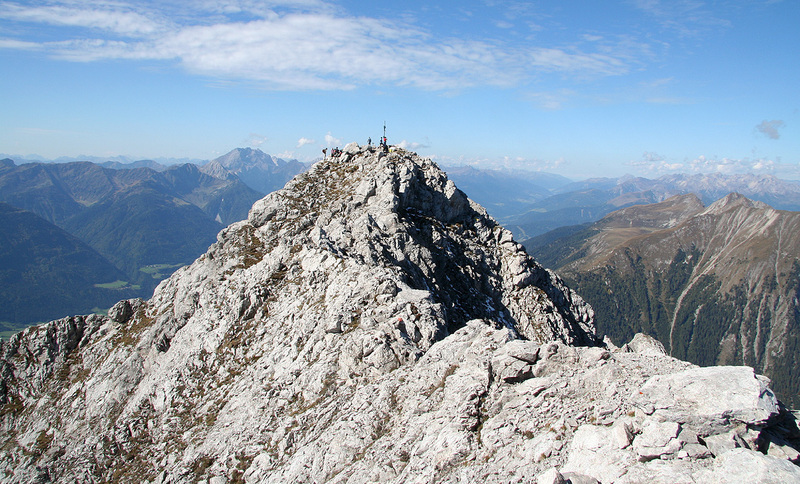 Reisskofel, as seen from Drautal, the vertical rise is 1900 meter. 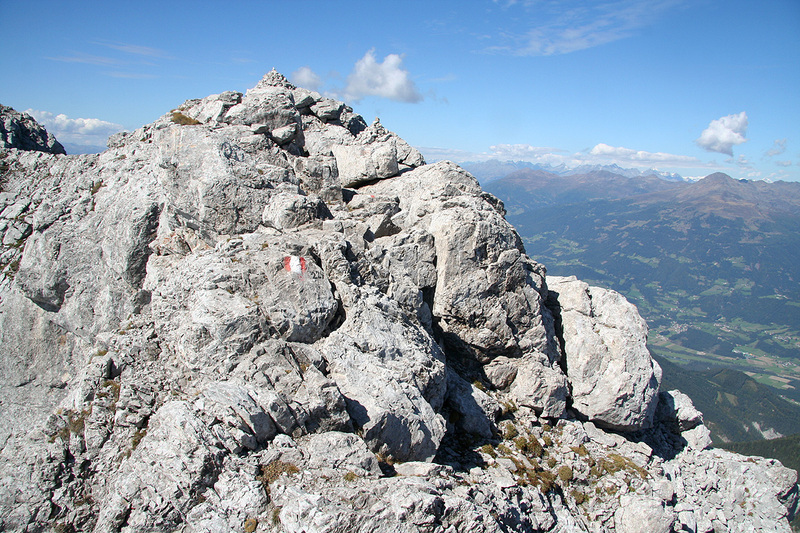 Part of the top ridge, the small col is marked with a red cross.